I expected that you won't enjoy this one as much as the others. Too many imperfections of Bollywood are obvious. Their production values have only risen the last ten years or so. I still think you should check out SRK and Kajol's later cooperations "Kuch Kuch Hota Hai" and "Kabhie Khuchi Kabhie Gham" because they are essential Bollywood viewing. Especially the later (KKKG) I really can enjoy again and again. So if you plan to only buy one of these, go with the second one. And you really should go Blu on this one. I even have double-dipped here. Thanks again for the recommendations. I looked for these two but they are not on UK Blu as yet and have held off on the DVD's. I also did check the earlier titles Krrish and Koi... Mil Gaya but they were silly prices at the time I checked but Krrish seems to have come down a bit now, around the £8/9 mark including postage, but although said to be 2-Disc Editions the Marketplace traders are saying it is a single disc. Koi... Mil Gaya is still silly money at over £200. Koi... Mil Gaya is still silly money at over £200. I found it cheaper at Play.com. Overview: Ghajini is the largest grossing Hindi Film of all time. It is the only Indian film to earn One Billion Rupees at the Box Office across India and it Grossed 4 Million US Dollars overseas within a week of it's release. My Thoughts: A very interesting film. A Bollywood song and dance romance but with a very dark edge. The story is well told and the film's constuction helps to maintain the story with the film having two halves with two big sections forming each half. These sections are the lighter side of the film being that they are about the romance. However they are each bookended by the dark side of the film with Sanjay (Aamir Khan) dealing with his short term memory loss and its cause. Parallels can be drawn with Memento as that also deals with short term memory loss and the protagonist's, both here and there, handle it in similar ways but I would have to rewatch Memento before I can reach any real conclusions. Aamir Khan, always the perfectionist, did a great job in this one. Both in the light and the dark side of the story. He usually throws himself into a movie. For this one he worked out for months to get the physique you see on the cover. When you watch Fanaa, you see that this is not his normal appearance. Also Asin did a great job. She is really lovely in this movie. She is the only one who also played in the original Ghajini. This one you were watching is the Hindi remake of a Tamil movie. Both movies were directed by the same guy. Aamir Khan, liking the Tamil movie, convinced the director to remake his movie with a bigger budget in Bollywood. It was Asin's first role in a Hindi movie. I hope I get the chance to see her in more. Overview: It started with a loveable ogre... who befriended a talking donkey... and rescued a beautiful princess in the unforgettable story that broke the mould for all animated films to follow. Now comes SHREK FOREVER AFTER, the hilarious and fitting finale to this record-breaking, Oscar®-winning* movie phenomenon. My Thoughts: The fourth and supposedly final chapter in the Shrek saga. 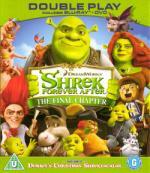 Shrek (Mike Myers) is suffering from mid-life angst where every day has settled down into a standard routine. Matters come to a head and Shrek signs a contract with Rumpelstiltskin (Walt Dohrn) whereby Shrek is granted a day to relive his days as a feared ogre and Rumpelstiltskin receives a day from Shrek. However the day that Rumpelstiltskin receives from Shrek has ramifications far and beyond what Shrek imagined and now Shrek must try to stop Rumpelstiltskin's machinations. Overall I did enjoy this film and it seemed to me to be better than the third but still not as good as the first or second. Thanks for this background info Tom. Overview: Choices... to choose between right or wrong is simple, but what defines one's life is the decision between the greater of two goods or the lesser of two evils. This is the advice Zooni Ali Beg (Kajol) receives from her father just as she is about to venture out into the world on her own for the very first time. Little does she know that these very words will shape her life. Zooni, a blind Kashmiri girl, meets Rehan Qadri (Aamir Khan), a local tour guide and an incorrigible flirt. Her friends warn her against this good-for-nothing roadside Romeo, but she chooses to ignore them. It is now her time to discover life, and love. Is this really the right choice? My Thoughts: Wow what a film, totally not expecting that. I'm glad that the overview didn't contain any spoilers about Rehan (Aamir Khan) and that I hadn't read any reviews that might possibly have held spoilers. Another film with light and dark elements with the first half of this film being the light side but the second half given over to the dark. So far my favourite Kajol movie, where she isn't partnered with Shah Rukh Khan. You know, I still envy you, that you got all these Bollywood movies on Blu. No problemo. I'm enjoying them all so far. Well I have the Blu's of Kuch Kuch Hota Hai and Kabhie Khuchi Kabhie Gham now ordered and the seller of those has both My Name is Khan and Taare Zameen Par listed as being available on Blu. I'm sorely tempted but will wait and see how the first two turn out as the only previous order I had from this seller was via amazon marketplace whereas these four titles are listed on their site but not on amazon in this form. Overview: They're armed, dangerous...and downright crazy! Buckle up for an adrenaline-fuelled, action-packed thrill-ride starring Liam Neeson, Bradley Cooper, Quintin "Rampage" Jackson and Sharlto Copley. Convicted by a military court for a crime they didn't commit, a daring team of former special forces soldiers must utilise thier unique talents to break out of prison and tackle thier toughest mission yet. It's going to take guts, split-second timing and an arsenal of explosive weapons - this is a job for The A-Team! 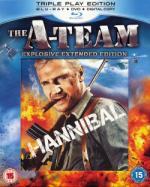 This triple play edition of The A-Team contains a Blu-ray, a DVD and a Digital Copy - for you to enjoy when you want, where you want! My Thoughts: I watched the extended version and thought that it was the usual park-your-brain mindless fun. There were aspects to link back to the original TV series but in general this film took the team into a slightly different direction. 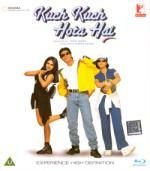 Overview: Kuch Kuch Hota Hai (Something is Happening) is a story of 2 best friends at college. Rahul (Shahrukh Khan) and tomboy Anjali (Kajol). Unknown to Rahul, Anjali has fallen in love with him - When Rahul confesses that he is in love with Tina (Rani Mukerji), Anjali is heartbroken and decides to leave the college so that Rahul and Tina can get together. My Thoughts: Oh dear. What can I say. Just have to repeat myself. Another wonderful recommendation of a film. This film is a weepy romance with a comedic edge. Weepy bits start from the off and continue on and off until almost the end just over 3 hours later. The first half of the film is the story of Rahul (Shahrukh Khan), Anjali (Kajol) and Tina (Rani Mukerji) as related to Tina and Rahul's daughter via a letter written to her before Tina's death after giving birth to her. The second half is how their daughter follows her mother's wishes as expressed in that letter. You think that one was weepy, than wait for Kabhie Khuchi Kabhie Gham. But it is a different kind of weepy. Supported by (IMO) great music. As you don't seem to be put off by "weepy" movies, I have another great recommendation for you: "Kal Ho Naa Ho"
Especially if you also enjoy Kabhie Khuchi Kabhie Gham. Try to avoid reading spoilers for it though. Okely Dokely. Hoping to get to watch this on Sunday afternoon. Ok, I had a quick look round for it and the e-tailer I got this and K3G from has it in Blu so I'll probably be hitting the order button on Sunday evening assuming that I do like K3G. May also take the opportunity to upgrade My Name is Khan as I caught part of it this afternoon on a satellite HD movie channel.